Nothing else has these unique novelty patterns and colors! 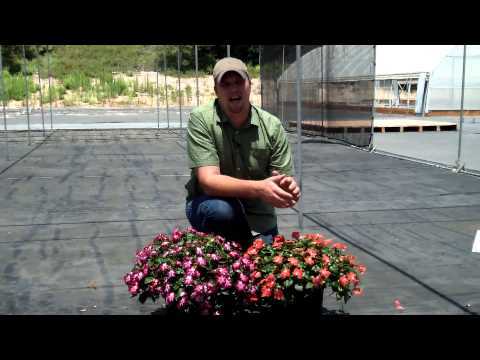 Low-maintenance, grower-friendly impatiens require no special culture. Best for premium, 12 to 14-in. (30 to 35-cm) baskets and large container programs. Also suitable for 6-in. (15-cm) pots, quarts and gallons. Comments: Avoid saturated media. Reduce mist as soon as possible. To reduce stretch, transplant on time. Plant Growth Regulators (S) = spray / (D) = drench: Bonzi(S) 5-15 ppm is effective for height control. Florel(S) 100-300 ppm can be used to improve branching but will not usually be needed. Comments: Start feeding immediately after transplanting. Avoid water stress in all stages of crop. Avoid cold stress (night temperatures below 65°F/18°C). Maintain EC above 1.0 (SME). Use early PGR application to achieve ideal finished plants. A light Bonzi drench when plant is three-quarters of finish size will promote flowering above the foliage.